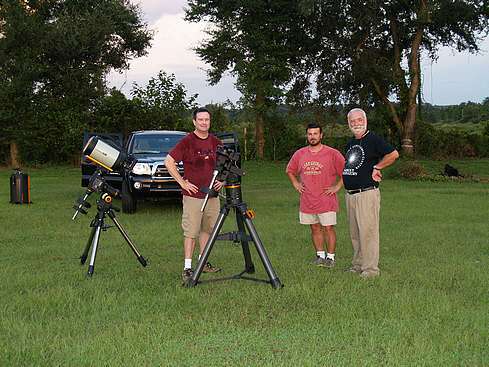 Dennis Farr (extreme right), owner and founder of the FarrOut Observatory in Dade City. FL poses with Kevin Dowden (extreme left), and Brian Buttafuoco stand ready around Kevin's CGE Pro EQ awaiting nightfall to start the observing session. It has been quite a while since my last trip to the FarrOut Observatory, and being under pristine skies since recouping from my stroke. So, I thought it good time to join Dennis Farr and the FOO group for the months new moon observing session. I also wanted to bring out my Carton 100mm f/13 "Mary Dawson" refractor for its first dark sky debut, and to introduce it to the rest of the members. When I arrived, there was only one vehicle in the yard, but no signs of bodies. I parked to the left of the entrance and walked toward the main shed, which Dennis Farr's RV was parked behind to the north. Not seeing anyone I walked back to my car and suddenly heard the door of the RV opened. It was Dennis and John, another FOO member. I was starting to get a bit worried that it no members were coming because of the iffy weather we were experiencing. Actually, I ran into rain on the way to the site from Riverview. Anyway, it was great to see others out ready for the night. Other members arrived later, but the elite astrophotography members were no where to be found. Drats!!! I was hoping to give Kevin Reese an introduction to long-throw (long focal length) refractors. Along with the Carton, I also brought out my Tasco 7te-5 60mm f/16.7. From center and moving to the right are my Carton 100mm f/13 "Mary Dawson" (center) and the Tasco 7te-5 60mm f/16.7 (extreme right) refractors. Brian is to the left performing some work on his new 12.5" f/5 truss Newtonian. His 8" f/6 homebuilt Coulter Newtonian is to the right of him in the photo above. Here are two images of Venus taken at prime focus using my 90mm f/11 refractor and Olympus Evolt E-300 digital SLR. The first image (left) is a 1/80 second exposure, and the second image (right) is 1/50 of a second; ISO 400. 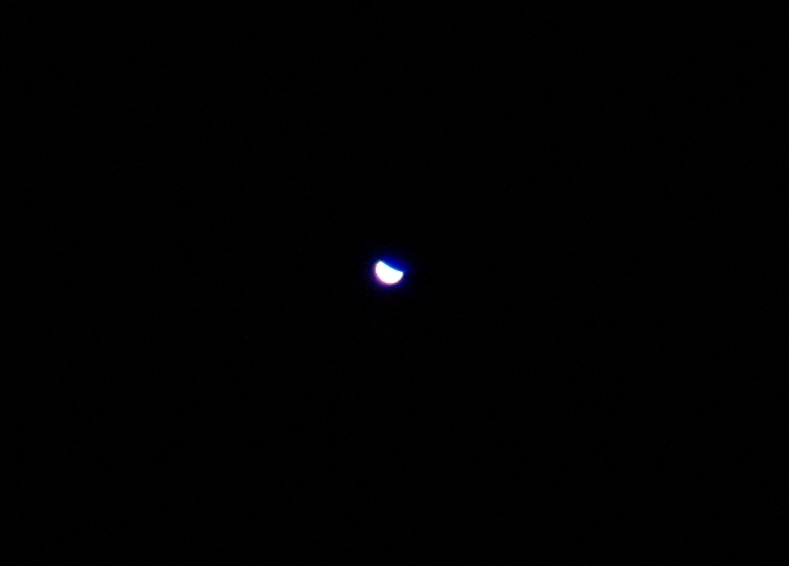 As you can see, Venus is now showing a slight crescent phase, which actually revealed an irregular terminator. I wanted to take more images of the Double Cluster, but out of the four 30-second exposures I was able to capture; only one was a keeper. I wish I were able to take even longer exposures. Unfortunately, at present my DSLR is only capable of up to 30-second durations. That is only until I receive my shutter release for the battery unit I will be connecting to the E-300. This will allow me to snag images of up to 8 minutes exposure time. I should be receiving this unit soon. A better EQ would have been of great help too. 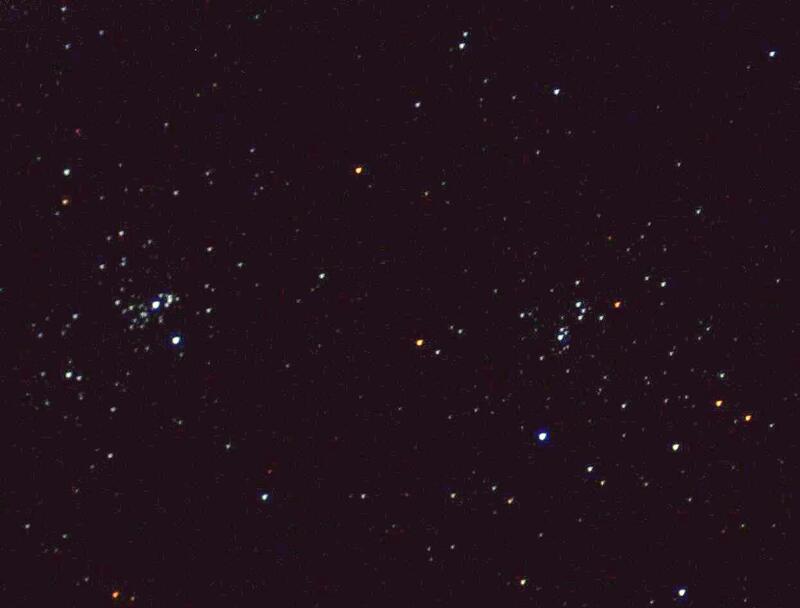 The Double Cluster in the constellation Perseus as imaged by Mel Dawson out at the FarrOut Observatory. This is a single 30-second prime focus exposure image at ISO 400. During those periods when clouds obscured prime celestial objects of interest, we all would gather around either Bob Stelmock’s observing area, or Kevin Reese’s. Bob was out with his 110mm f/5.9 William Optics Megrez refractor sitting atop a sweet Atlas EQ mount. He also was out with his Challenger RV! Below is a photo of Bob’s setup. Bob Stelmock truly came prepared for a grand evening. Here we see his 110mm f/5.9 Megrez refractor with Atlas EQ mount connected to his Dell laptop running EQMOD software to control it. A great application Bob is working hard to master. Behind the scenes is Bob’s Challenger RV. 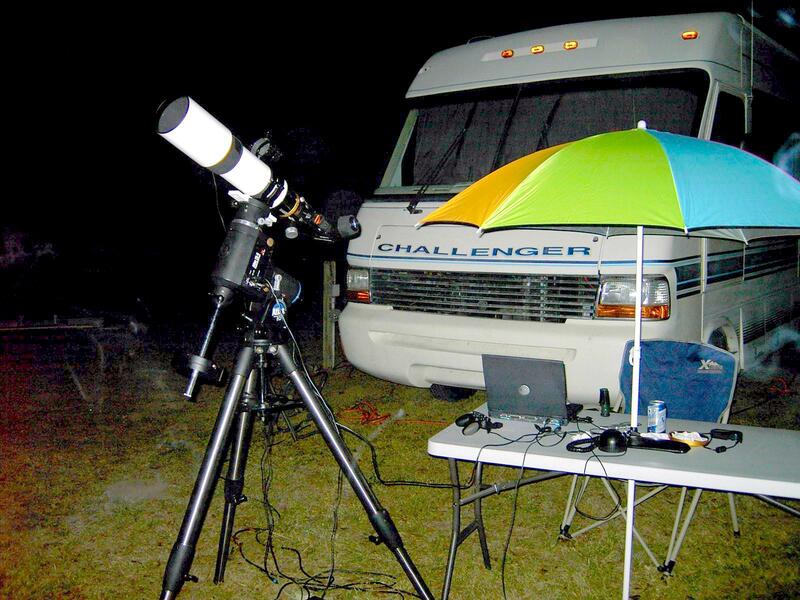 Bob will be going to the Winter Star Party 2009 down in Miami with his RV on February 21, thru 28, 2009. As for Kevin Reese, he arrived after dark at the site with his wife Pat. He brought along his TeleVue 5” f/5.2 NP127 Apochromatic refractor and his 80mm. Both telescopes were sitting atop a modified Atlas EQ. Indeed an awesome telescope array. We tried checking out several objects in the NP127 using his TeleVue Nagler 22mm eyepiece, but the skies were just horrible. Even though the sucker holes were few, and opened to nothing interesting! We tried catching the Double Cluster through the 127mm TeleVue, but the sucker holes would close up. I only wish I had taken a picture of his setup. But before I knew it, Kevin had started packing up after the skies failed to clear up by 22:00, and he and Pat left around 22:45. No sweat! There will be other times for sure. Later on at around 23:00, a leading edge of clearing to the northwest moving to the southeast pushed over the area revealing pristine skies. As Dennis predicted earlier after surveying the satellite imagery on NOAA's site. By then I had packed up my things and placed them in the 1997 Malibu. Below is an image of my setup for the night. Here is my setup for the night’s FOO observing session. We have here my Hybridized Konus 90mm f/11 refractor, with Olympus Evolt E-300 DSLR attached. To the lower right of the photo, you can see my 80mm f/6 APO triplet refractor sitting in my eyepiece case waiting its turn to be trained on the night’s sky. But, I decided to stick with the 90mm for the duration. So with all my scopes put away, and Kevin leaving, I hung out with Dennis and Bob to take in some views through their instruments. 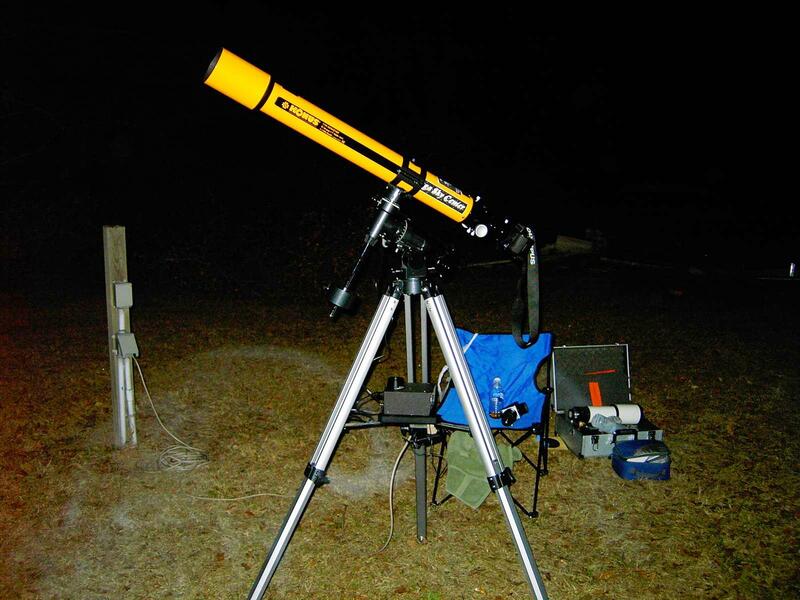 Dennis’ C-11 NexStar GPS SCT was trained on Saturn with a 9mm ocular inserted in a William Optics 2” star diagonal. With the rings nearly edge-on, it was indeed a beautiful site, reminiscent of an olive with a toothpick through its center. Saturnian Martini’s anyone! We also checked out the open galactic cluster M37 and the Andromeda Galaxy M31 in the 11” SCT. What a view that was! Dennis used his 32mm eyepiece. I am not completely certain, but I believe both of the eyepieces Dennis used were Meade’s. Now with the sky being glorious, I was considering resetting up my equipment again. But, it was kind of late, so I decided not to. Then I proceeded over to Bob’s arrangement. He was very excited with working with EQMOD; a cool telescope navigation software application compatible with a number of mid and high-end equatorial mounts. Despite some issues Bob will have to iron out with the software, he was very good at working with it. With additional time, I am sure he will have mastered it. We looked at M37 in Auriga through his 110mm f/5.9 Megrez. But, Bob’s main focus was on calibrating the Atlas drive to the EQMOD software application.